*Pacifica Grand Resort and Spa* is located on top of Cerro del Vigia in Zihuatanejo, famous for its spectacular location to watch the sunset in the Bay of Zihuatanejo. Members staying at Pacfica Grand are allow to use the Pacifica Resort Ixtapa that houses 6 outdoor pools, and 6 specialty Restaurants. El Faro: with its international cuisine and Mediterranean accents located on top of the hill, with the best view of the bay. The Tulips: serving breakfast, lunch and themed buffet dinner by the beach. Bugambilias: Italian cuisine and friendly service. Moon Bar: offers delicious oriental experience to walk to the beach. 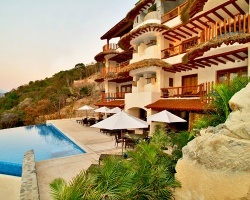 Suspiro: with its Mediterranean cuisine and unparalleled views of the bay Zihuatanejo. La Ceiba: traditional grilled lobster outdoors and La Pampa: classic favorites and beautiful sunsets. The resort also has its own cable car circuit, a convenience store, gift shop, kids club, diving school, travel agency, theater, spa, fitness area, transportation 24 hours a day. 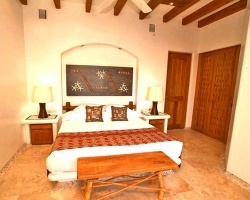 Suite features a terrace with ocean view and a mini pool! Buyer may receive a title fee credit, inquire for details!